Astronomers Can’t Explain Why This New Galaxy Has Hardly Any Dark Matter « Adafruit Industries – Makers, hackers, artists, designers and engineers! It’s hardly an exaggeration to say that dark matter is one of the biggest mysteries in the universe. 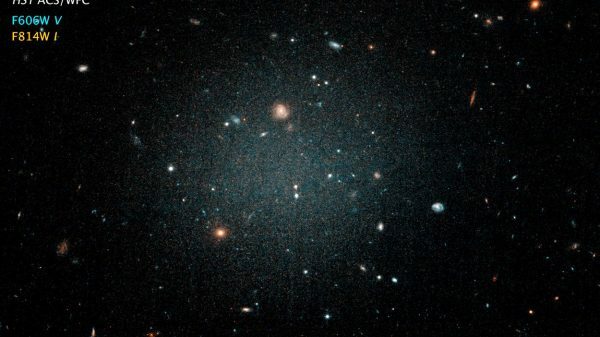 Cosmologists haven’t directly observed the stuff, but based on measurements of baryonic matter—the type we can see—it is thought that about 27 percent of the universe is made up of dark matter. The leading theories about the structure of the universe describe dark matter as a particle that acts like a sort of galaxy starter. The basic idea is that dark matter particles gravitationally attract hydrogen atoms until they are dense enough to form stars. To exert this kind of gravitational influence, however, there has to be far more dark matter in a galaxy than ‘ordinary,’ baryonic matter. And that’s exactly why the recent discovery of NGC1052-DF2 is so puzzling. This galaxy hardly has any dark matter at all, which has lead astronomers to wonder how it could have possible formed in the first place. It’s the only galaxy of its kind that has ever been observed and may have huge implications for theories of dark matter particles and galactic formation.